Online casino Crazy Vegas often pampers its players not only with new bonuses, but also with regular slot tournaments. Especially popular among the audience of this institution are freeroll tournaments, which take place almost every day. By the end of September Crazy Vegas Casino has decided to hold a monthly slot freeroll tournament. The sence of the tournament is that you can start playing without any fees and additional fees for add-ons or rebuys. The current tournament will allow you to play online the slot machine Break Away. Therefore, the September tournament is automatically connected with a hockey theme. This event started on Friday, 12th September and it will last until September, 26th, at 22:00 GMT. The video slot Break Away was created by a famous developer of gaming software, the company Microgaming (check other Microgaming slots like Hot Ink). This is one of those products of the company which was based on the system All Ways. This means that each bet in this machine is made on each of 243 lines and the sizes of the bets are different. In this slot there is no bonus game, but there are free spins. 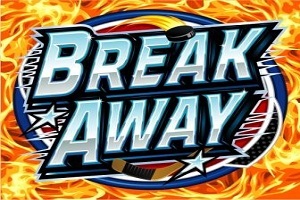 Break Away in functionality is not much different from the rest of its brethren, but it is a multiplayer slot. This means that the online game machine at the same time takes into account the large number of players and brings their results in a single table. The players can play on the ice and get the list of the leaders in the 5 reel slot, which is full of special features, such as: Scatter pays, Rolling Reels, Smashing Wilds and Stacked Wilds. 3, 4 and 5 Scatters trigger 15, 20 or 25 Free Spins with 10x multiplier. You must bet at least 50 coins per one spin. There are 10 levels of such bets, so the maximum bet per spin can reach up to 500 coins. The cost of each of the coins varies from 1 to 10 cents. Thus, the range bet per one spin is from 50 cents to $ 50. In the online machine Break Away there is no bonus game, but there is a great opportunity to accelerate the free spins or win even in the standard game. Thus, the developers created the Smashing Wild in the game. One of the players just hit the puck and the machine in which it fell, becomes a Wild symbol. In this tournament from Crazy Vegas the winner is the player who would be the best in the series of 20 spins on a parity of winning- losing bets. The player who made the best series gets € 4,000! Another 24 players will share the remaining € 16 000. Most importantly, the tournament has already started. It will last until September 26 inclusive, so you have another week to start playing and outperform the other gamblers. Remember that this tournament has no fees involved, so you will have an unlimited number of attempts to make the best series of 20 spins. “We are very pleased to provide our players with this burgeoning tournament. We are sure that they will spend their free time in Crazy Vegas », – said the spokesman of the institution, Harry von Shlyussel. In the leaderboard you are able to see the top players with the points they won. At the end of the tournament all the best players will get their prizes automatically. We would also like to note that Crazy Vegas casino regularly offers no deposit and other welcome bonuses, so you can start your game in this institution to activate bonuses. The new players can get a generous bonus for their first three deposits. If you have any questions about the freeroll tournament or other topics connected with the online casino, you are welcome to contact the support team 24/7 with a multilingual support.